I knew I wanted to include chocolate cupcakes for my party – when I found these in a book of recipes from famous international tea rooms, I couldn’t resist the idea of Bailey’s flavored icing. Want an even more Irish alcohol flavored recipe? Pair it with a Guinness cake (and ice cream?). The frosting definitely made these worth it, though I have my doubts about the impact of 2 Tbsp. of mashed potato in the cake batter. That seems like unnecessary pandering to Irish stereotypes to me. With melted chocolate and whipping cream in the frosting, it definitely starts out a bit runnier than most canned frostings. If you like thicker, whipped frosting, I’d recommend chilling it for a bit. I doubled the cake and quadrupled the frosting when I made these – wanting extra frosting for vanilla cupcakes – and the quantity of frosting also made it fairly runny, but we had fun licking our fingers after eating the first few trial ones. In a small bowl, combine flour and sugar. Melt the chocolate carefully in a double boiler or microwave. Chocolate can be deceptively easy to burn – I prefer to use the microwave and watch it very carefully, pulling it out to stir every 30 seconds at first, then ever 10 or so seconds as it starts to really melt. 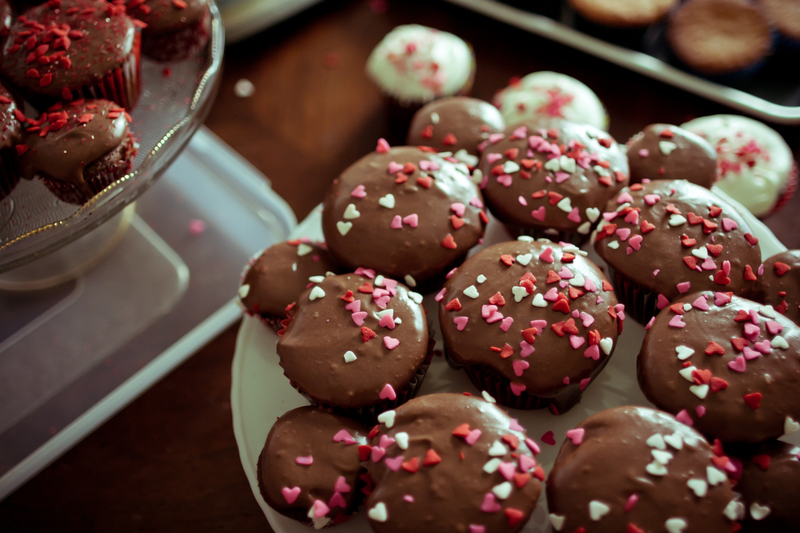 I’ve had too many recipes spoiled when I burnt all the chocolate due to a moment’s inattention – those were sad days. Melt the chocolate for the filling carefully in a double boiler or microwave. Remove rom heat and stir in the powdered sugar, cream, and liqueur until well mixed. The frosting starts off runny – chilling it and beating it again will make it fluffier, or you can let it be a bit goopier – it’s thick enough it won’t run off the cake entirely. Spread filling between cake layers and on top and sides of cake.